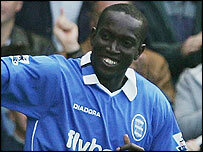 Dwight Yorke scored on his home debut to salvage a point for 10-man Birmingham at St Andrews. The hosts had fallen behind to a soft goal when Luke Young was on hand to prod home at the back post following a fumble from goalkeeper Maik Taylor. But Charlton were unable to hold onto the lead, despite the sending off of Damien Johnson for a second bookable offence following a foul. Yorke rose to arrow home Muzzy Izzet's corner with a bullet header. But while Yorke will steal the headlines, David Dunn will take the plaudits. Manager Steve Bruce threw both players on as a last throw of the dice and the dynamic duo gave an urgency to the misfiring, goal-shy Blues. Dunn, returning from injury, orchestrated the revival with prompting passes from midfield and his quick-thinking from a free-kick caused chaos in the Charlton defence which led to the corner from which Yorke scored. Up to his entry Birmingham had seen plenty of the ball, but what they enjoyed in possession they lacked in creativity. They were unable to break down a hard-working Addicks outfit intent on damage limitation having conceded four goals in each of their previous Premiership away games. After a dour first half, Young put some life into the game early in the second half when he capitalised on a calamitous error from Taylor. Danny Murphy set the move in motion when he benefited from Izzet and Robbie Savage performing their very own version of Laurel and Hardy by running into each other. The former Liverpool man released Jonatan Johansson who put in a low, drilled cross that Taylor failed to grasp and Young ghosted in ahead of Mario Melchiot to score. Any hope of a home revival looked lost when Johnson was dismissed after cynically tripping Johansson. But the sending-off forced Bruce's hand and saw the introduction of Dunn and Yorke. And despite the numerical disadvantage the game turned in the Blues' favour. After levelling the match Birmingham looked the more likely to go on and claim all three points, and although they failed, Dunn's return lifted the game. Bruce will be hoping he can now help lift the Blues up the table after a stuttering start to the season. Birmingham: Maik Taylor, Melchiot, Upson, Cunningham (Yorke 61), Gray, Johnson, Savage, Izzet, Gronkjaer, Heskey, Morrison (Dunn 61). Subs Not Used: Bennett, Martin Taylor, Clemence. Charlton: Kiely, Young, Fortune, Perry, Hreidarsson, Kishishev, Murphy, El Karkouri (Rommedahl 76), Hughes, Lisbie (Euell 75), Johansson. Subs Not Used: Jeffers, Andersen, Konchesky.